This post will walk you through building an Android Emulator for the Nook step-by-step in Eclipse and via the command-line. These instructions are based on the original instructions located at the nookdevs website. 1. You need to have Eclipse running with the Android SDK. More information on that can be found here. 2. I'm assuming you are developing in a Linux-ish environment. 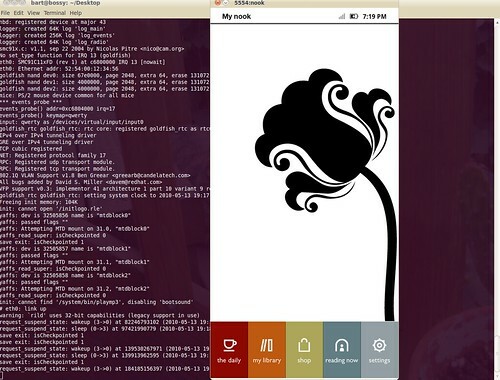 I'm using the amazing Ubuntu Lucid Lynx. 3. download and set up the following tools: smali, baksmali, unyaffs, yaffs2image. smali and baksmali. Description from the developer's site: "smali/baksmali is an assembler/disassembler for the dex format used by dalvik, Android's Java VM implementation". 1. Download them into your ~/bin/ directory. 2. "chmod +x" the wrapper scripts (smali and baksmali) 3. rename the jar files: smali.jar and baksmali.jar. unyaffs description: Unyaffs is a program to extract files from a yaffs file system image. 1. download unyaffs into your ~/bin; chmod +x unyaffs; mkyaffs2image: 1. download mkyaffs2image. I downloaded the yaffs2-binary.tar, untarred it and copied yaffs2/utils/mkyaffs2image to my ~/bin/ and chmod +x it. Okay we have the tools and our environment is ready! 5. Rename bravo_update.dat to bravo_update.tar.gz and extract it. This uncompresses another Firmware_Update folder, cd in to it. Now we are going to build an android AVD, so we can extract a single file to use back in this system. 15. re-create the system.img with the new audio file. this creates a new system.img 16. Sketchy step where you overwrite the good Android 1.5 platform system.img in your Android SDK with this new one. Remember to change this back later if you want to do non-nook related Android Development. 17. run the emulator! This is a blog about all of my loves and obsessions: board games, vim and emacs, programming, painting, cats and science fiction.